Ever since we started to think about buying an inn, we wondered how our cats would take to being innkeepers’ pets. What would be in it for them? Well, for one, they’d have us home and around to cater to their every need (or so we imagined). And instead of rushing out in the morning and leaving them in 8-10 hours of silence, we’d have more stimulation and activity for them during the day. We used to come home after work, traffic, gym and errands ready to collapse, only to be reminded, first by our welcome mat, then by the now rested and restless cats, that “it’s about TIME we got home.” But they had to move quickly to get our full attention: it didn’t take long (just un- and repacking, showering, microwaving various things – heat pads, hot toddies, tea, coffee, dinner) before we dissolved into hours of quiet again, dozing or grading or sleeping, the only signs of life coming from the Real Housewives of Bravo and whatever violent Showtime movie Siobhan fell asleep to. They had to squeeze in all their demands – to be let in and out, played with, petted and brushed, chased and fed and treated with Party Mix – into the few hours a day we weren’t prone or out of the house, doing whatever it was we did to put Fancy Feast into their bowls. They didn’t care what that was; they just concluded we can’t be very good hunters if it takes us ten hours a day to bring home one bag of Petsmart stuff a week. It’s not that our owners quarters aren’t big enough – they’re not squeezed into a basement or two sunless rooms at the back of the inn, nor are they divvied up into odd portions that no cat, much less a human, could figure out how to live in. (And believe us, we’ve seen versions of all three during our inn search). And we didn’t have to rent or buy a separate house, either – although the cats will probably soon want us to. Or maybe just a separate yard, a bigger and grassier one, with lots of birds and mice and bugs to kill, and a wooden deck to roll on. The problem is that our house is semi public for part of the day (the breakfast rooms are behind the office, right between the kitchen and the living room), meaning it took a while for our two less anxious cats to make this dire situation work for them. (The third, very anxious cat, is still figuring it out). At first they were all stuck upstairs, hiding in closet corners, behind the long unpacked boxes, or under the bed – or sitting in window sills plotting escape. Eventually they realized that between 7 pm and 7 am, the coast was generally clear: as long as they made it back upstairs before the first breakfasters invaded, they could get in some outdoor birdwatching in the morning; and after 7 or 8 in the evening, the downstairs has gradually felt safer and become theirs. That’s the time for phantom mice hunts, closet explorations, rug gymnastics, and the many other things cats do at night that we simply have no clue about. But what about the 12 hours between the beginning of breakfast and the No Vacancy sign? – and quiet, sweet, well adjusted cat, whose one stress reliever is to claw carpeted staircases and litter box liners. (We don’t yet have any such staircases, but she did discover the one carpeted stair in the office, which, if left to her devices, would probably be bare by now). Anxious cat still spends most of the day upstairs, arming himself only occasionally with extra layers of caution if boredom becomes too extreme and he has to venture into the kitchen or yard (other downstairs areas are too scary before evening). Attempts to pet him during such ventures are futile – trust is in short supply during the day, his little head still full of moving/ driving / being stuffed into a carrier trauma months ago. Carpet clawing cat made a decision weeks ago to live her life around commotion and make it work for her, Buddha style (or similar). She just does her own thing, chasing birds in the yard or chattering at them from the warm cat tree inside. In the absence of carpeting on our main staircase, carpet cat is now limiting upstairs ventures to litter box trips. She is also wondering why she can’t, like she used to, have at least one litter box in the kitchen. In the meantime, she’s working on dismantling office carpeting and moving it into owners quarters, piece by piece if necessary. In the off season, innkeepers tend to repairs, updates, and other investments. New innkeepers with pets, or at least with picky pets like ours, probably have to make pet and guest projects equal priorities. Our first project got done quickly: a larger fenced outdoor area, and a cat fence on top of the regular fence. Our next one will get done next week (knock on (literal) wood): carpeting the staircase and the upstairs landing. Yup, only 50% of this project is not cat related (noise,warmth, and nostalgia for some carpeting), but that’s ok – it’s about time they felt more like home. And further down the road, we envision some kind of spiral staircase from the bedroom window down to the backyard, so that at least anxious cat can avoid the breakfast crowds altogether and descend directly into the outdoors. But as far as grudging lover cat goes, material investments won’t do. 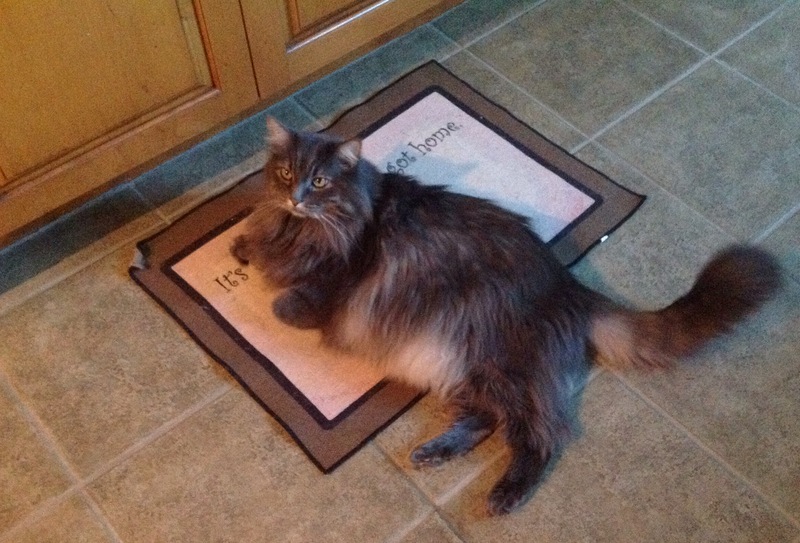 As long as we fail to drop everything for a half hour brushing when demanded, he will sit reproachfully on the old rug in the kitchen, with the same look on his face as the cat on the mat…..telling us that even when we’re home, it might still be high TIME for us to get there. 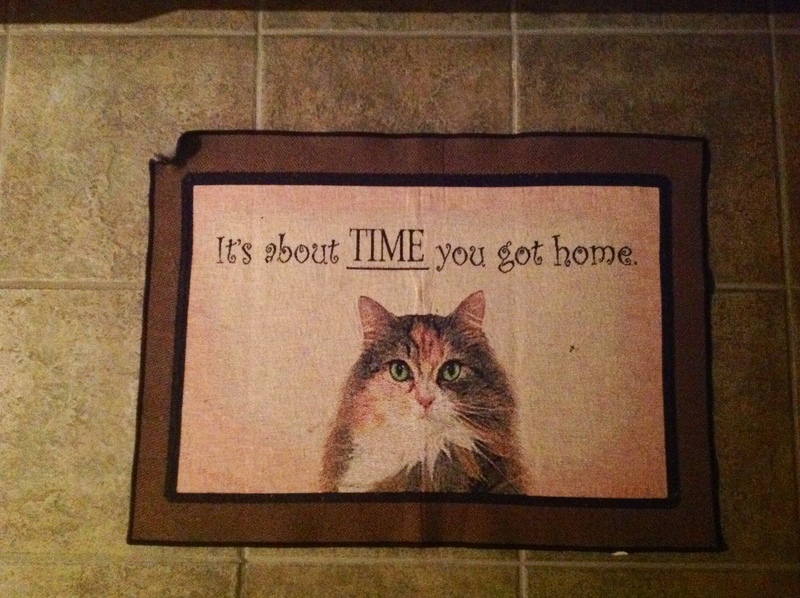 This entry was posted on Monday, December 16th, 2013 at 1:47 am and is filed under cats and innkeeping. You can follow any responses to this entry through the RSS 2.0 feed. Both comments and pings are currently closed.